Digital magazines emerge as a success when backed by a powerful strategy. Every single step for publishing your magazine dramatically impacts its market value and if done right, paves the path of glory. Distribution is one such important aspect that determines the future of how well your magazine is accepted and praised by the readers. Imagine a situation, where you have created and published an excellent magazine but went wrong in deciding the right distribution platform. All your efforts and hard work may go in vain on just a blink of eye. Thus, it is essential to keep the magazine distribution practices updated and in line to deliver where your audiences are. It is suggested to research the right audience, desired platforms, available resources, and overall marketing strategy. There are multiple ways to distribute your digital magazine. Distributing your digital magazine through a magazine app is a proven method to interact with contemporary readers. We all are aware of the popularity of mobile apps for consuming information on the go and this makes it a better choice for distributing digital magazines. Quick distribution is what you can be sure of while distributing your magazines through apps. Targeting the right audience, becoming instantly available, and growing your network are just a few other advantages. Want to read your favorite magazine while waiting at a coffee shop? Yes, you can do that too! With the magazine apps, publishers can display cleaner layouts, easily navigable pages, and leverage tons of interactive multiple features like enhanced interactivity, high quality multimedia, share buttons to social platforms, in-app or external linking, and other device specific characteristics. Analytics capability is one of the other major perks that accompanies the publishing on mobile apps, obtaining a data is quicker and easier which can further be analyzed to better target and improve internal publishing and distribution strategies. Digital magazine publishers can utilize any preferred design software to publish design and enrich their magazines. The designed magazine apps can be successfully distributed to the desired marketplaces (say Apple’s App Store, Google Play Store, and Amazon Kindle store) or other online marketplaces of choice. These magazine apps are then downloaded and installed by the readers on their native devices. Once installed, the publisher can successively publish issues and send notifications for the same. PDF magazines are another excellent option for small publishers or those having limited resources. They can be easily created and exported using any design software or PDF editor. PDFs are often considered as an enhanced digital version of a print magazine with the advantage of portability. Unlike in print materials, a publisher can add interactivity by providing hyperlinks, jump links, info graphics, or high-quality images to give an edge to the static magazine content and enhance readability. The designed PDF magazines can be easily distributed to the readers in the form of a downloadable PDF over the mails or websites or any other marketing mediums. This gives an option to the readers of whether they want to the downloaded and read the magazine on their mobile phones or desktops. However, in PDF magazines, the file size needs to be carefully monitored as this often becomes a limitation where readers have a difficulty and downloading and scrolling through PDFs if the file size exceeds a few tens of MBs. 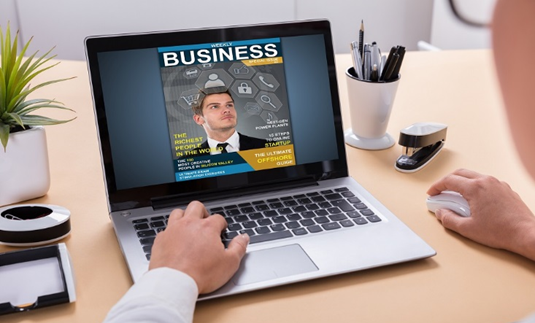 Distributing your digital magazine over a website is a great option if there are no resource constraints. Creating a complete website for the magazine helps in reaping long-term benefits and gaining popularity in the magazine market. In addition to increasing website traffic, this process has better readability, broader consumer base, enhanced user-experience, share-ability, and no storage limitations. the freedom to access the magazines as and when desired using various browsers on phone or desktops. Every single piece of content has a designated page with lots of interactivity and scope of improved user engagement. Adding video and impressive images to gain, retain and grow more audience is just a click away. It allows a better communication flow between the publisher and user in terms of comments and feedback. Not only this, one can scale the features of their magazine like adding the buttons to their social media platforms, and utilizing analytics services to get feedback and improvise. To create a website magazine, a publisher can pick the best fit from a number of website publishing services in the market, some of which are absolutely free. While all the mentioned distribution approaches have many similarities, each of them possesses unique attributes. One may choose a single method or go forward with a hybrid policy comprising of more than one plan. A combination of multiple platforms may be what can help you come across more eyeballs. Take some time to research and step ahead.